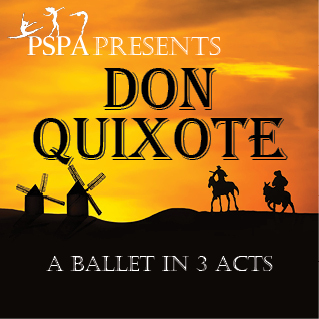 Don Quixote is a ballet in three acts, based on episodes taken from the famous novel, Don Quixote de la Mancha by Miguel Cervantes. First created in 1869 with music by Ludwig Minkus and choreography by Marius Petipa, most of today’s versions are based on the 1902 Bolshoi production by Alexander Gorsky. The story features the venerable Don Quixote who dreams of being a chivalrous knight. He and his servant Sancho Panza set off in search of adventures and to find his beloved Dulcinea. In Barcelona he encounters the young couple Kitri and Basilio who are in love despite objections from Kitri’s father, Lorenzo. He wants to marry her off to the rich local nobleman, Gamache. The young couple escape the city for the forest of gypsies where Don Quixote mistakes Kitri for Dulcinea and battles a windmill he thinks are giants preparing to harm her. Ultimately all the participants arrive back to the town where Kitri and Basilio dance their famous wedding pas de duex. All dance roles will be danced by PSPA pre-professional students and guest artists under the age of 19. The role of Espada, the Toreador will be danced by former PSPA student, Bret Coppa, now a member of Atlanta Ballet. Filled with crazy characters and lots of exciting dancing, this is a ballet the whole family will enjoy. All ticket sales are final and non-refundable unless an event is cancelled and not replaced. No refunds or credits will be offered on previously purchased tickets if a promotional price is offered later.